Left to right: Nakamura Utaemon IV representing China as Koshi (Confucius), Seki Sanjūrō III representing India as Shaka (the historical Buddha), Ichimura Uzaemon XII representing Japan as Amaterasu (the Sun Goddess). "This print shows a man forming a circle with thumbs and index fingers (Amaterasu Ōmikami), a man pointing one finger to heaven and the other to the ground (Shakyamuni) and a man with a towel on his head gesticulating as if he were stroking his beard (Confucius). 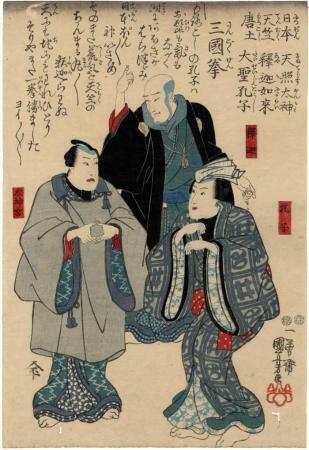 In this print, the portraits of three popular actors are depicted, who made a name for themselves in the performance of the sangoku-ken (three-country-ken) in the play Shinki ikken tori no hatsu koe, which was staged on New Year's of Kaei 2 (1849) at the Ichimura-za kabuki theater. Seeing as the two censorship seals (Yoshimura, Muramatsu) of this print are dated December of Kaei 1 (1848), a month before the performance, it is obvious that this is a print pre-announcing the performance. Furthermore, there are nishiki-e with a similar motive including the sangoku-ken song beginning with the text “Omae onna no na de O-Ise-san” (You are a woman, by the name O-Ise). Regardless of whether the publication occurred as a pre-announcement of or after the performance, there exist many prints of the sangoku-ken with these two songs in the inscription. Yet, one can assume that the song “Omae onna no na de O-Ise-san” was more popular, as the prints released after the performance with that song text were greater in number. The three countries in the name three-country-ken refer to Japan (Amaterasu Ōmikami), China (Confucius) and India (Shakyamuni). After song and dance, a ken is played with a three-sided blockade, in which Japan defeats China, China defeats India and India defeats Japan."